If you live in Aurora, Colorado, you’re probably aware of the high percentage of professional athletes who come from the city. From major league baseball and pro basketball players to world champion bodybuilders and rodeo stars and everything in between, Aurora was their birthplace or the place they grew up in. In addition to spawning a variety of athletes, the “Gateway to the Rockies” was named Sports Illustrated magazine’s 50th anniversary “Sportstown” in 2004. This award was given because the city attracts more than 30 regional and national sports tournaments to places like the 220-acre Aurora Sports Park. All these venues mean that there are lots of events for fans to attend, but what if you’re in a financial bind and don’t have the wherewithal to take advantage of all the games? Perhaps you’ve ended up with substantial debt and are looking for a way out of it so you can enjoy all that Aurora has to offer. If that’s the case, take heart—your debt relief solution could be just a phone call away. Whether it’s debt settlement, debt counseling or debt consolidation, Aurora residents can find help today. Call 800-910-0065 now for your free debt evaluation to find the solution that best fits your circumstances. There is a variety of debt solutions available to those struggling with massive debt. While there’s no one-size-fits-all solution, there are options that might fit your debt situation better than others. Here’s an overview of what may be available to you in Aurora. 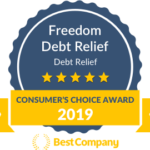 Debt consolidation is a process where Aurora residents can get a loan from a debt consolidation program or a bank to pay off your current debts. Most consolidation loans require collateral — a high-value asset such as a home or a car. On the one hand, it can help you get a lower interest rate, which means you pay less over time. On the other hand, if you do fall behind or can’t make your payments, you’re in danger of losing your asset, which means your house could be foreclosed on or your car seized. The other option is to get an unsecured loan. These loans are harder to come by and have much higher interest rates because the lending company doesn’t have any guarantee that you’ll repay the entire loan outside of a binding signature. An unsecured loan could help simplify your repayment process, but it could also lead to a greater amount of debt in the long run. If you don’t have massive debt or just want some tips on how to reorganize and reprioritize your budget, then debt counseling could be right for you. A debt counselor may help you build a budget that meets your needs and helps you pay down debt. Be aware that debt counselors also often lead you to other services, such as debt consolidation. Aurora residents should research debt counseling services in the area for a comprehensive list of services. If you have a lot of debt, debt resolution could work best for you. With debt resolution, you partner with a company to resolve your debt for less than you owe. The company negotiates with your creditors on your behalf while you pay into a program account you control. When the debt settlement company reaches an agreement with a creditor, you can settle the debt using the funds from your account. This process keeps going until all your debt has been resolved with your creditors. Economically speaking, Aurora, or the “Sunrise of Colorado” as it’s also known, hosts a good many employers in the medical field—both public and private. On the public side, the top three employers are Buckley Air Force Base, Anshutz Medical Campus, and University of Colorado Hospital. The top three private employers are Children’s Hospital, Ratheon Company, and Kaiser Permanente. Even if you have a job at one of these companies or elsewhere, it doesn’t automatically mean that your finances are in great shape. Many Aurorans with good jobs are in serious debt, so you’re not alone. There are ways out—a possible solution could be just a phone call away. Speak with a debt specialist and find out how you can start your journey toward financial freedom.